Oh, say can you see more birds and more beauty? With its festive banner front, Betsy's Birdhouse gives a resounding yes-yes, to showing your true colors even as you hail your birds with truly inviting hospitality, and yes, to quality that never ever "flags." Year in, year out, this lovely home says God Bless America, and God Bless Our Birds! 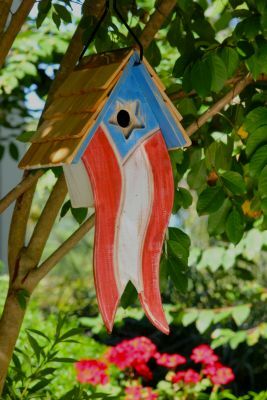 Patriotic banner front on this perfectly functional birdhouse allows you to fly your true colors while the 1 1/8" sized hole gives smaller sized birds a place to nest. Handmade in the USA from rot and insect resistant cypress wood. Clean out, drainage and ventilation built right in!